The Summer Book is a beautiful book. It's as if Tove Jansson took someone's most lovely summer memories and put them into words. 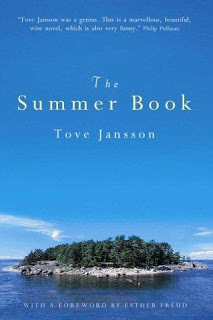 I was drawn to it at first because it is about living on an island during the summer in a Northern climate. Being an island dweller, I know the best time to experience life here is in the summer. Gentle summers create the memories I hold onto during the brutal winter months. The Summer Book is a series vignettes chronicling the day to day life of Grandmother and Sophia (and sometimes Papa). They have small adventures on their island in the Gulf of Finland. Grandmother is coming to the end of her life while Sophia is just six but dealing with the loss of her mother. Jansson wrote it just after her mother died, basing the characters on her own mother and niece. There is a pall of melancholy over the book. Jansson creates an excellent example of show-don't-tell in The Summer Book. In each vignette, we are shown how the characters feel through the things they do or say. We aren't told Grandmother is doing something to help Sophia feel better or that Sophia reacts the way she does because she is afraid of losing someone else. It's in everything they do. I don't know how a story about a tent could bring me close to tears but Jansson did it. There is plenty to laugh about as well. Jansson wrote children's stories as well and this has that feel to it even though in is a book for adults. In a well written children's book, the story is simple but the message is a complex one. It is the same for The Summer Book. She knew children well enough to create a believable one in Sophia. Kids say the most startlingly true things at times; they express their anger and fear in surprising ways as well. They are complicated little creatures. The Summer Book is the kind of book you read when you are some place quiet where you can ponder every sentence in peace. Yay, I'm glad you loved this book. I fell in love with it when I read it last year. Like you, the setting has some resonance for me, as when I was very young I lived on an island in Maine. I've been wondering about this one because a friend of mine loves the Moomintroll books, which I might not have read young enough. Sounds like this one would be more my speed. I loved this book for its deep respect for childhood, among other things. She's an amazing writer. This sounds like a lovely book ... and I loved the excerpt you shared. And looking at the cover, I want to just walk right on in and stay there! This is one of my favorite books -- and I only discovered it this summer. I agree that the book is enhanced by a quiet reading space. Every word is important. Great review, Chris. aw, that sounds wonderful. I may have to hold off a few years if peace and quiet are required! I have Jansson's True Deceiver, but not The Summer Book- I hope to read her some time soon. Everyone seems to adore her! Very true, this is perfect for reading and pondering when you're in a quiet place.